The traditional and famous ‘BIOS’ firmware interface of Windows has been replaced by the powerful UEFI in Windows 8. UEFI, Unified Extensible Firmware Interface, is a specification that defines an interface between operating system and the computer hardware. It has CPU independent architecture and CPU independent drivers. It also defines a ‘boot manager’ that has the boot configuration details and loads the operating system along with necessary drivers. It can access all the devices, peripherals and even the internet access of your system. BIOS was a limited specification with limited code space with 16-bit code. However, today’s intensive processing needs are met by faster processors like 32 or 64-bit CPUs. And so, an interface was needed that can take advantage of the advanced techniques. BIOS boots by reading a sector in the hard disk that further located the additional code and executes it. In contrast, UEFI loads the .efi program files that are stored in a partition of the hard disk, called ‘EFI System Partition-ESP’. These EFI programs can utilize EFI boot and run-time services. Secure boot feature requires a ‘digital signature’ of boot loaders which in turn requests signature of kernels, drivers and services; hence it becomes difficult for malware authors to insert their code into the pre-boot process. This improves the overall security of the system, keeping the Operating System safe and secure from being corrupted by unauthentic services and drivers . UEFI uses the GUID Partition Table (GPT) that uses 64-bit entries in its table which makes UEFI capable to boot from drives larger than 2 TiB of storage. Note that BIOS can only address up to 1MB of address space using the Master Boot Record table. Press Win+C to open the charms bar. Scroll down and under ‘Advanced Startup’ , click ‘Restart Now’. This will restart your system and takes you to the Advanced Startup options. 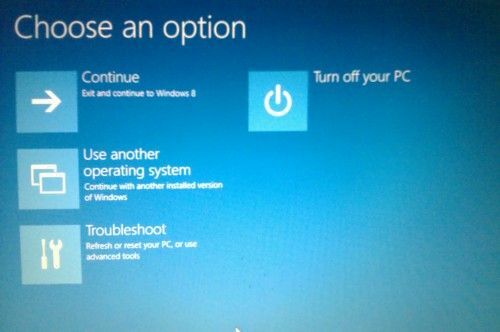 If you have a single Operating System on your computer then you will see ‘Use a Device’ option instead of ‘Use another operating system’. It will allow you to boot your computer from removable media such as USB drive, CD/DVD drive, SD card, network boot, and so on (depending on your computer system). Select Troubleshoot -> Refresh your PC. 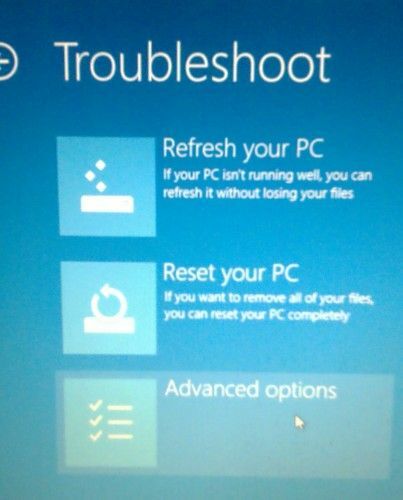 Or Select Troubleshoot-> Reset your PC. Go to Settings -> Change PC settings -> Select the General tab -> Scroll down to see the Refresh/Reset options. Enter the Advanced option screen and now, you need to be careful about your every click and selection because it is going to effect the way your system boots up. 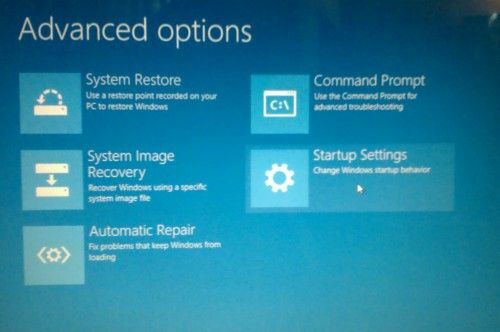 System Restore, as the name says, it restores your system to the last good configuration known. If you want to recover from an image file, select System Image Recovery. Or if you are less techie, simply go for an Automatic Repair. You can enter the command prompt mode by selecting ‘Command Prompt’ from the ‘Advanced options’ screen. It will prepare command prompt for you and asks for the credentials too before you access the command prompt. If you want to quit the command mode, type ‘exit’ in the command prompt and hit ‘Enter’. ‘Driver signature enforcement’ and ‘Early launch anti malware protection’ refers to the ‘Secure Boot’, so disabling them means disabling Secure Boot. We have tried to take a smooth ride of the UEFI options and its booting process along with the possible options to play with the system settings. If you have any query or confusion, don’t hesitate to post it in the comment box below. Turn off the PC, and put in the Windows installation DVD or USB key. Boot the PC to the DVD or USB key in UEFI mode.